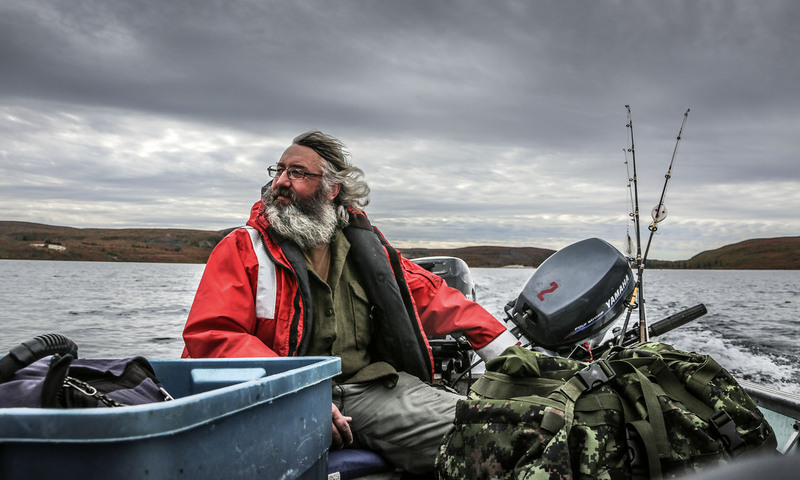 Roberto Serrini heads to the northernmost point of Canada in search of magic. What he finds is so much more. For the first time in my life I didn’t care when my luggage came out at the baggage claim. I had plenty of entertainment as I stood there watching a polar bear lunge toward a seal that was diving through an iceberg, right on top of the carousel. It took one car, two trains and three planes to get to Yellowknife Airport in Canada but, staring at this massive Arctic diorama, the post-travel disorientation had me thinking I had walked into the Museum of Natural History in New York. 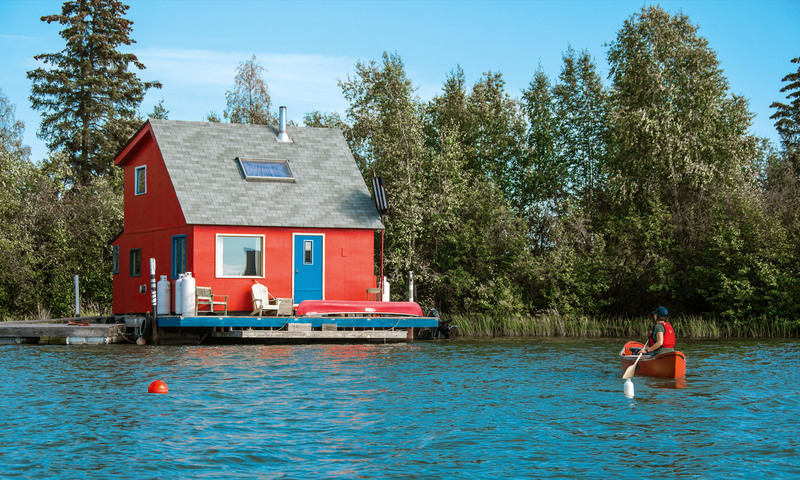 Bright bakehouses add a pop of colour to Great Slave Lake in Yellowknife. Instead, I am in one of the northernmost towns on the planet in Canada’s North West Territory, about to take part in an Arctic Photographic Adventure with My Backyard Tours. It’s an area so remote that they didn’t bother to even give it a specific name – they called it North West as if to say “It’s over there somewhere”. Yellowknife is a true frontier town. It’s full of miners and bush pilots, has a shop that sells sealskin mittens, a saloon full of liquor, tattoos and piercing options, and even a general store that stocks rifles, baby formula, and local lore. No time is wasted introducing our small group of six to the wonder of Yellowknife. Our tour leader and local photographer Robert Berdan takes us through a private tour of historic Old Town and the Prince of Wales Heritage Center, which offers a comprehensive overview of the complex history of the land from the First Nation natives and explorers, to the future of this mining-turned-tourism destination. We are just setting the scene for the spectacular landscapes we are about to explore. Our boat carves a ribbon through the indigo mirror that is the Great Slave Lake, floating past flashy houseboats, each one dazzling with its brightly coloured and flamboyantly artistic uniqueness. We travel north along the Ingraham Trail in search of the majestic Cameron Falls. Robert points out the wildlife and shares titbits of history, unlocking the secrets of the area as we all gaze in amazement at the prolific beauty of this far-flung area. Well outside of the city lights of Yellowknife, we stop at a place called Aurora Village. This region has remained somewhat of a secret from tourists despite being one of the best places on the planet to view the aurora borealis. Experiencing this phenomenon here is possible almost year-round with the clear winter nights of November to April offering the best sight, while the mild temperatures of summer and early autumn make it a tad more comfortable. The village consists of a great dining hall, gift shop, and a village of mansion-sized teepees that glow bright orange in the darkness thanks to the wood-burning potbelly stoves inside. The scene is set and Robert quickly runs through some pointers to help us get the best shots of the aurora. We turn our heads toward the heavens and wait. When the lights finally take to the stage to perform their five-hour magical dance, we’re all left slack-jawed. I’ve yet to see a photo that communicates just how otherworldly the phenomenon is. Ribbons of green and purple float across the diamond sky, as if a god’s silk scarf has fallen from the heavens and been caught in the celestial breeze. I feel the awe of the people around me, and a strange sense of community forms from the amazement. It is truly enchanting and one of the only things I’ve come across that offers a childlike belief in magic. Still high from the previous night’s experience, we are greeted back in Old Town by Chuck Rockwell, a tall, friendly man who is our Air Tindi bush pilot. He’s flying us to the final destination on this tour, Peterson’s Point Lake Lodge, which sits an hour north. After a champagne toast we find ourselves skimming across Great Slave Lake in a Twin Otter seaplane. With a quick right bank into the wind, we are on our way. Below us, lakes dot the surface of the land like a car bonnet after a rain wash, caribou trails dart in various directions, and from this height, the patchwork of pigmented terrain resembles the colour static on an old CRT television. We spot the cluster of cabins that are our home for the next five nights. Swooping down, the plane gently jostles to a stop atop the sandy lakeshore where we are met by the wide smile of Amanda Peterson, owner and matron of this unique nature refuge. Caribou are some of the many incredible animals you will find up here. One of the photographers takes in the beauty of the never-ending vistas. Inside the communal cabin we are greeted with fresh blueberry scones and cranberry muffins pulled from the giant iron stove just minutes before by Norma, the resident chef. We discuss the next five days; hikes through the Arctic expanse, tracking caribou, wolves and bears, world-class fishing, fine home-cooked meals, and of course, more of the aurora. Our guides are as much family as they are employees – they are well-versed outdoorsmen who have been visiting the lodge since it was just a summer home that Amanda’s father built by hand. Now it is bigger, with multiple cabins featuring diesel stoves, sinks and solar panels, and even Wi-Fi. The lodge has a real nostalgic feeling, like being welcomed by long-lost family members. It is paradise of a different kind. In this land of a thousand lakes, we travel via boat in every possible direction, and our legs carry us through the painter’s palette that is the Arctic tundra. Explosive reds, orange, greens and blues attack our notion of natural in this cartoon land. The few trees here reach six feet high, and the shrubs look like manicured bonsai. There are sand dunes, hundreds of feet high and miles long, left thousands of years ago by the slowly retreating ice shelf. Mosses and lichens cover every inch of ancient black rock and the thick bog pads each step, making it feel like we’re walking on a giant memory foam mattress. The landscape outside Peterson’s Point Lake Lodge looks like a Georges Seurat painting. One of our knowledgeable guides navigates across Peterson’s Point Lake while keeping a close look out for wildlife. Our guide’s keen eye calls out the wildlife in the distance. A mother and calf caribou swim swiftly across a great expanse of lake and a lone white wolf ascends a nearby peak looking for its next meal. There are times when our eyes avert to the ground to study mushrooms, and we pick the blueberries, cranberries and crowberries lying low under our feet. With every step, the tundra sprays us with the sweet-pine scent of Labrador tea and berry – it’s as if we were walking through the perfume department of the tundra store. My fishing skills normally extend to hunting for keys in the couch; however, even I’m able to easily snag a catch in this place, reeling in several large pike that would later become lunch. On a nearby beach, the fish are battered and fried up on large cast iron skillets, accompanied by buttered potatoes and fresh salads. There is nothing quite like catching your own meal, except maybe a dinner cooked by Norma, who I think was actually Julia Child in disguise. Caribou steaks, chicken Florentine, lasagna, and an array of delicious meals are served – our bellies full and our imagination even fuller from the day’s scenery. Each night, over cake and hot drinks, Robert gives a brief presentation about photography, covering subjects from composition to processing, preparing us for the next day’s hunt for the perfect photo. On the final night, we gather together in the main cabin and relive the magical experience through each other’s eyes, gaining the unique perspective of the many facets this beautiful land has to offer. This was more then a typical holiday; it was an otherworldly experience. Exploring a land so remarkable, it felt like the validation of magic. Flying on one of Air Tindi’s private seaplanes gives a whole new perspective to this beautiful land. The last morning, as we await our seaplane, I gaze out to the vast expanse. We had spent nearly a week exploring and photographing this precious beauty, and yet there was so much more to discover. That’s the enchantment of Peterson’s Point Lake Lodge and Yellowknife; these are places you never fully return from. Their beauty is simply too magnetic not to leave a piece of yourself there, waiting for your return. United Airlines and Air Canada can take you to Yellowknife via Calgary or Edmonton from Sydney or Melbourne. Expect to pay around AU$1838 return. From there Air Tindi offers chartered flights to Peterson’s Point Lake Lodge, which can be arranged via the lodge. There are many hotel options in Yellowknife, such as the grand Explorer Hotel, which is a sublime experience. Once up at Peterson’s Lake Lodge, accommodation consists of clean modern cabins and the main lodge offers a communal lounge, hot showers and wood-fired sauna, while accommodations are limited to one of the many cabins. My Backyard Tours will make this incredible experience come to life, seamlessly organising your flights, hotel and transportation, as well as a tour of Yellowknife.